Sunday morning was beautiful, the white snow on the green, red, and yellow leaves; the blue sky, with a tinge of pink around the edges. I knew that if I could make it to a local church, I could get a warm lunch. It wasn’t too cold outside for much of the day, but as it got dark it got dark, it started getting cold, and I had to think about where my family and I would sleep and stay warm. We sleep best in surroundings we know, but would it be too cold tonight? We stopped by the local shelter to be with some people, watch a little television and decide where we would spend the night. There were some available cots in the shelter, but we decided to sleep in our familiar place which we thought would be more comfortable, even though it was getting colder. Monday morning rolled around. There was no school for the little one, so we all headed over to the library to warm up and wondered when and where we would get a chance to get our next hot shower. No, this is not the story of a homeless family in Connecticut. It is the story of one of the hundreds of thousands of people trying to get by after a freak October snow storm left much of the state without power. Several Community Health Center sites were without power and were closed on Monday. 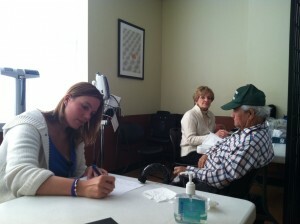 Yet, the “Wherever You Are” team managed to meet the needs of homeless people at the Friendship Center in New Britain. They cheerfully announced on Facebook that they even had donut holes available. As we wait for the power to come back on across Connecticut, let’s keep in mind those for whom finding a hot meal, a clean place to shower, or a warm place to sleep are daily tasks. Let us pause to thank those who work hard to offer help to the homeless, especially the CHC WYA staff.